Helping women now. Providing help and inspiring hope to those affected by breast cancer through early detection, education and support services. Breast cancer is one of the leading health crises for women in the United States. 1 in 8 women will be diagnosed with breast cancer in their lifetime. There is currently no known cure for breast cancer, and its early diagnosis is critical to survival. The mission of National Breast Cancer Foundation (NBCF) is to help women now by providing help and inspiring hope to those affected by breast cancer through early detection, education, and support services. One of the key aspects of an impactful charity is networking and collaborating with other organizations, which is why NBCF works with many partners on several different health and educational fronts. Communicating with frontline health professionals and those directly affected by breast cancer helps NBCF ensure that its Programs continue to help those in need. There is still a need, however, to spread NBCF’s mission to underserved women across the country and the world. There are still women who need access to accurate and understandable breast health information. Women still need help with the financial and emotional burdens of struggling to pay for the mammograms they need. With additional funds, NBCF could expand its National Mammography Program into more cities and rural areas that are not being served today. This opportunity could drastically improve the outcomes of breast cancer and save the lives of many women. With additional support, NBCF could also expand Beyond the Shock® into dozens of other languages that could reach every corner of the world. Amplifying these two programs could drastically improve the outcomes for breast cancer patients and their loved ones. While NBCF is spreading the message of early detection across the U.S., there are many areas around the world that need our life-saving message. Breast cancer is on the rise in Asia, Africa, and Europe, and unlike in the U.S., the survival rates are decreasing. We see a critical need to join hands with scientists, doctors, researchers, and advocates around the world so that together we can make a global impact on the lives of women. We have much to offer other countries about the effectiveness of breast cancer awareness, but we also want to learn from doctors and scientists who are diagnosing and treating the disease so that we can share this knowledge. The National Breast Cancer Foundation was founded in 1991 by breast cancer survivor Janelle Hail. She was diagnosed with breast cancer in 1980 at the age of 34. At the time of her diagnosis, there was little information about the disease, and she was forced to make a decision about her health with few options. 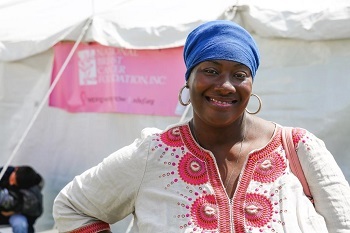 After her treatment, Janelle made a commitment to help women around the world by educating them about breast cancer and the importance of early detection. The cancer burden is borne disproportionately by minority and underserved populations, who often do not have access to the information and/or the financial resources to receive crucial breast cancer screenings. NBCF works to address these problems through its ground-breaking programs for those in need, empowering women with the information and tools to take charge of their breast health. Underserved women are becoming increasingly vulnerable and need life-saving intervention now. According to The National Cancer Institute, women aged 40 to 74 years who have screening mammograms have a lower chance of dying from breast cancer than women who do not have screening mammograms. The American Cancer Society recommends women age 40 and older have access to annual mammogram screenings to provide early detection of breast cancer. However, many simply cannot afford the cost of screening tests. These women are at a significantly higher risk of dying from breast cancer if later diagnosed. NBCF provides grants to hospitals to fund breast care procedures, such as mammograms, ultrasounds, biopsies, and computer-aided diagnostics. NBCF provides grants to hospitals to fund salaries and administrative costs of the nurses and social workers who help guide women through the cancer care system. NBCF has begun a pilot program to fund retreats for patients with metastatic breast cancer. 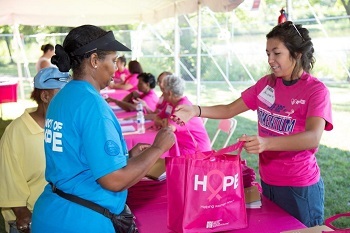 NBCF partners with Convoy of Hope, a disaster relief organization, to help fund and conduct breast health education tents at community outreach events across the United States. NBCF funds Pink Ribbon Red Ribbon’s efforts in Zambia to provide breast cancer outreach, education, and screenings. NBCF created and maintains Beyond The Shock, a free, comprehensive, online community guide to understanding breast cancer. NBCF’s Research Program funds targeted breast cancer research at MD Anderson’s Moon Shots Program. Research shows that more screening mammograms means more lives saved, and providing these free breast cancer services helps remove the financial and emotional barriers to early detection that many women are facing. The cancer care system can be confusing and intimidating, and patient navigators help guide women around barriers and to timely diagnosis and care. Patient navigation helps women feel less stressed and scared about their health situation, and they also learn life-long coping and health management skills. Metastatic breast cancer patients often feel forgotten or misunderstood, and the retreats help women facing similar situations give and receive support, have important conversations, and make critical preparations. Educating women in their communities and connecting them to local health resources helps empower them to make informed decisions about their health. Beyond The Shock’s informational videos and community forums help those touched by breast cancer find high-quality health information and a place to express and receive emotional support from others facing breast cancer. Triple-negative breast cancer (TNBC) has been very difficult to treat, and patients diagnosed with TNBC face a difficult prognosis. This Moon Shots Program looks at the similarities between TNBC and high-grade serous ovarian cancer (HGSOC) in order to improve the outcome of this disease and further advancements in personalized therapies. NBCF is focused on Helping Women Now. Our mission is to provide help and inspire hope to those affected by breast cancer through early detection, education, and support services. That’s why NBCF partners with medical facilities across the United States that ensure continued quality healthcare throughout the entire cancer care continuum. Our goal is to be the compassionate go-to resource that provides women with extraordinary and accessible resources. In addition to our educational and support programs, we also connect and refer those affected by breast cancer to helpful external resources. Our unique Patient Navigator Program is a very special and integral piece of our National Mammography Program. This Navigator Program is a proactive and personalized approach to helping patients overcome the barriers of cost, fear, and misinformation surrounding prevention and treatment of this disease. 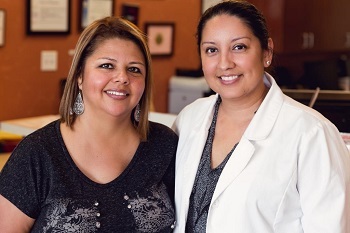 Our Navigators are the bridge and resource to help women navigate the healthcare system, and they provide much needed support and encouragement for women in need. In the U.S., there has been a significant increase in the survival rate of breast cancer since the early 1990s. This is a result of efforts by organizations like NBCF that educate women about the importance of early detection. The message of early detection is working, but we have to continue the effort until the overall survival rate is 100% or the disease is cured. One of our greatest accomplishments has been creating the National Mammography Program. Through our network of qualified partner hospitals, NBCF provides free breast health, screening, and navigation services for women who cannot afford them. A program that started at one hospital in Texas has now expanded to over 80 medical facilities across the United States. To date, NBCF has helped provide an estimated 280,000 screening and diagnostic breast care services and over 900,000 patient navigation services to women in need. In 2011 NBCF launched Beyond The Shock®, an online resource and top-rated breast cancer app for women diagnosed with breast cancer. BeyondTheShock.com utilizes ground-breaking technology and the resources of the global medical community to create an accessible platform for understanding a diagnosis of breast cancer and to help those touched by breast cancer understand all the treatment and support options available to them. Beyond The Shock videos have been viewed over 5 million times, and there are over 60,000 questions and answers in the community forum. Women often share their stories of how their fellow survivors have helped support them along their journey, and companies and health organizations have used Beyond The Shock’s educational material to educate the people they serve. We understand that people want to know where their money is going, and NBCF has proven that it can be trusted to use its funds responsibly. NBCF maintains the highest standard of fiscal management and targets 75-85% of all spending directly to its programs. Last year, 83% of our funds were directed to our life-saving programs, showing why we are one of the highest-rated breast cancer charities in America. Charity Navigator, America’s premier charity evaluator, has given NBCF its highest 4-star rating for eleven years. The rating is based on NBCF’s ability to responsibly manage its finances and operations. Additionally, NBCF strictly adheres to IRS regulations as well as policies and procedures set by our Board of Directors, and conducts annual audits by an independent accounting and audit firm. 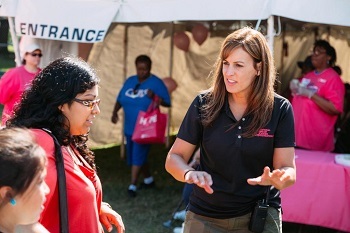 One of NBCF’s Community Navigators helps assist guests at a Convoy of Hope event. A guest at a Convoy of Hope event posed after expressing how much she enjoyed the event.